In 1942 a winter trigger (Winterabzug) was developed for the K98 in order for the soldier to keep his gloves on during extreme cold weather. 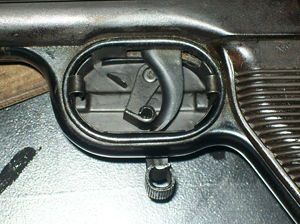 The winter trigger was standard issue for the German sniper. 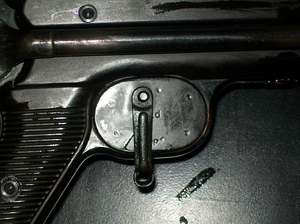 Immediately after developing the winter trigger for the K98 a version for the MP38 and 40 was developed. The design was almost the same but it could not be exchanged. 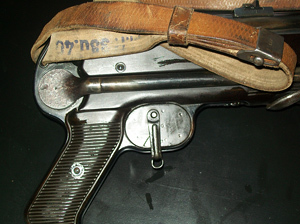 The wintertrigger was an oval sheet-metal box of which one side could be removed. 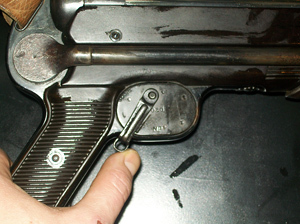 By pressing a small external trigger connected to a lever the "real" trigger was pushed. 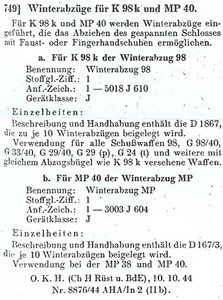 The winter trigger was made by Allweiler A.G.,Gotthard, Pumpenfabrik, Radolfzell a/Bodensee. The code was "ezd". As far as I know there are no winter triggers (for the mp40) with different production codes. 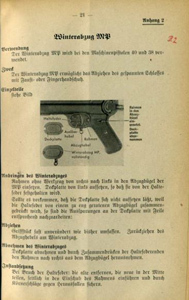 Apart from the code there is also stamped "MP" which off course stands for Machinenpistole. The wintertrigger did not fit the MP38 grip without customization. 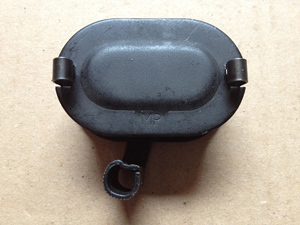 Unlike the MP40, the bakelite foregrip of the MP38 is not shaped to allow a wintertrigger to fit. In 2007 a batch of winter triggers was found in Finland. They came out of a barn which was put on fire by the germans in order to destroy the military stock. These were offered at e-bay. The winter trigger is a very rare item these days. 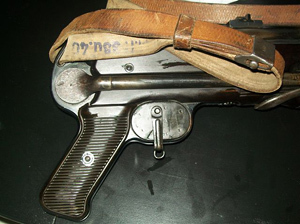 Just as happened with the K98 wintertrigger we now see reproductions of the MP40 winter trigger entering the market as well. By the end of 2012 a few were offered on ebay.The differences are clear but you got to have an original to compare. Finding an original one is near impossible. For the K98k and the MP40 Winter Triggers are introduced for which it is possible to trigger the extended bolt wearing mittens or gloves. Description and maintenance is included in the D 1867, that is enclosed with every 10 Winter triggers. 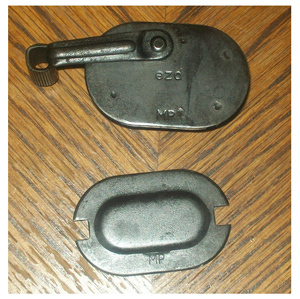 To be utilized with all 98 rifles, G 98/40, G 33/40, G29/40, G 29 (p), G 24 (t) and others that have the same trigger guard as to K98k comparable weapons. O.K.H. (Ch H Rüst u.BdE), 10.10.1944 Nr. 8876/44 AHA/In 2 (IIb). The Winter trigger MP makes it possible to trigger the extended bolt wearing mittens or gloves. 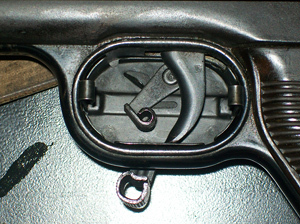 Inserted framework in trigger guard . Cover plate removed. 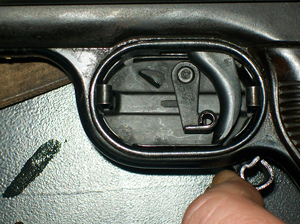 Insert the framework without tools from right to left in the trigger guard of the MP. 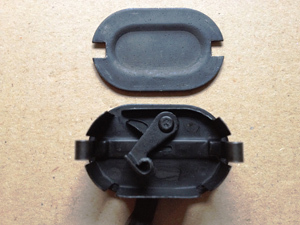 Put on the cover plate from the left so it is locked by the retaining spring. 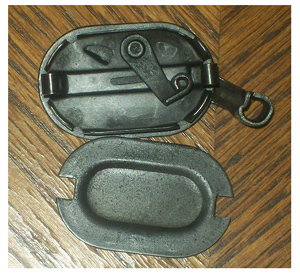 In the case the cover plate cannot be put on because the retaining spring is pushed together by a too tightly made trigger guard then widen the cutouts of the cover plate with a veil. Remove the cover plate by pushing together the retaining springs and pulling the framework to the right from the trigger guard. If the retaining spring is broken remove the old one, break the new one in the middle, insert on the side in the opening of the framework and secure from falling out by punch marks. 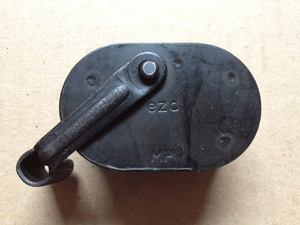 The pictures below show the wintertrigger installed on a MP40. It is clearly depicted how the mechanisme works. (Rolf V. Collection). Pay attention to the fantasticly preserved original sling.